The Australian Institute of Building is active in communicating its position and policies to its membership and the wider industry. The mechanisms used includes a weekly enewsletter sent to over 5000 senior practitioners, industry leaders, suppliers and consultants. In addition the AIB actively engages with the Australian and International press through a professionally focused media release program. All AIB recent media releases can be accessed via this site. DesignBUILD is Australia’s leading event for Architecture, Building, Construction and Design professionals. This last period has seen our awards submissions close and early bird registrations for Constructing our World in September open. Our full Council face to face meeting in March has now set some programs in place to work on recently approved initiatives. With thanks to Infrastructure Partnerships Australia for providing the 2019 Federal Budget Summary. The Australian Government will provide funding to support national infrastructure projects following the release of last night’s Federal Budget. Aluminium Composite Panels (ACP) have been at the centre of a number of investigations in Australia and around the world. The development a permanent labelling system for ACP has been identified as a necessity. Standards Australia is seeking advice from industry and other stakeholders on the proposed approach for labelling of Aluminium Composite Panels. Large construction companies with an annual revenue of more than $30 million have until the end of March to get their financial reports to the Queensland Building and Construction Commission (QBCC), or risk court action. The BMF commissioned the Building Confidence report, an independent expert examination of the broader compliance and enforcement problems within Australia’s building and construction system. The report concluded that there are a number of significant systematic deficiencies with Australia’s building industry culture and Australia’s governance arrangements, and made 24 recommendations to address these (see Table 1). In the first case in Australia brought against a Member’s company, in relation to aluminium composite panels (ACPs), VCAT apportioned zero costs directly to the builder. The Coalition Government is determined to see more women in work in Australia’s building and construction industry, our nation’s third largest industry. This week has seen a significant amount of AIB representation at activities focussed on cladding. I have had a few days involvement in the public arena with the assistance of our CEO Greg Hughes. This week saw the NSW State Government release the final report from the independent investigation into Sydney’s Opal Tower issue/s. The AIB was last week invited to attend and present to the Building Ministers Forum (BMF) in Hobart along with 21 other industry and employer groups as a follow up to the last meeting held in August 2018. The Building Ministers’ Forum (BMF) met today in Hobart to discuss progress with priority issues relating to the safety of Australian buildings, and public confidence in the building and construction industry. The ABCC has commenced proceedings against the CFMMEU and six of its Queensland-based officials alleging they intimidated NT Worksafe Inspectors and demanded that the head contractor shut down construction at the Palmerston Police Station site. The Australian Honours system celebrates individuals who rise above the everyday and mark the extraordinary in our society. Awards were announced on Australia Day 2019. As the industry starts to waken for another year and we get rid of the sand between our toes from the family break, a couple of things to mention first up. Minister for Housing and Public Works, Mick de Brenni said that maintaining confidence in Queensland’s $46 billion a year industry was paramount in the wake of concerns raised over the structural integrity of NSW high rise apartment development, Opal. Home owners will be better protected from dodgy certifiers under the NSW Government’s zero tolerance approach to the cowboys in the industry. Minister for Better Regulation Matt Kean revealed a four point strategy, that builds on recent legislation and strong penalties, in an effort to fix Labor’s bungled privatisation of certifiers. The Liberal National Government has welcomed a report urging the Western Australian Government to adopt key recommendations to ensure subcontractors working in the state’s construction industry feel more confident about being paid on time. The Coalition Government is strengthening the Australian Building and Construction Commission (ABCC) with $3.7 million over four years from 2019-20 in additional funding and resources to boost its ability to enforce the rule of law on building and construction sites. The Building Products Industry Council (BPIC) supports the recommendations by the Senate Inquiry into Non-Conforming Building Products Final Report. The report is a reflection of many of the industry’s concerns about nonconforming building products (NCBPs) and the demonstrable harm they are doing to the public and the sector. Labor Senator Chris Ketter has today tabled the Senate Economics References Committee Report into Non-conforming Building Products: The need for a coherent and robust regulatory regime. The final report hands down thirteen recommendations around national consistency and regulation, better consultative and reporting mechanisms and border protection. The Queensland Government has released its approach to the consistent and progressive implementation of Building Information Modelling (BIM) on major government infrastructure projects. Tasmania’s building and construction sector is going from strength to strength, and the latest ABS figures confirm Tasmania has recorded the highest growth rate in the nation with respect to new residential construction. The Coalition Government welcomes legislation passing through the New South Wales Parliament to protect subcontractors working in the state’s construction industry. As I alluded to in my last E News column, I can now confirm that we have invested in a new system that will make it significantly easier and smoother when it comes to submitting an entry for the AIB Professional Excellence Awards. Sub-contractors and their families will have better financial security thanks to new laws which passed the NSW Parliament overnight. Minister for Better Regulation Matt Kean said the security of payment laws will help stop subbies being left out of pocket for work completed each month. Optus Stadium has won the Project of the Year at the world’s leading stadium industry awards, beating out international competition and securing a remarkable 27th accolade since opening in January. Last week, myself and National President, David Burnell met with The Hon Karen Andrews’ (Minister for Industry, Science and Technology) adviser at Parliament House to set the scene of the AIB and discuss key issues affecting the industry. The Australian Institute of Building (AIB) last night (Friday 7 September) announced the National Professional Excellence in Building Awards for 2018. I was delighted at the most recent meeting of National Council where our leaders signed off on the Institute’s new Strategic Plan. Australia’s Building Ministers have agreed to develop an implementation plan for reforms aimed at ensuring the safety of the building and construction sector. The NSW Government, along with the Commonwealth and other states and territories, has called for mandatory permanent labelling of cladding products, Minister for Better Regulation Matt Kean said. State and Territory Building Ministers and the Commonwealth supported the move at the Building Ministers’ Forum (BMF), held in Adelaide yesterday. The Building Ministers’ Forum (BMF) met in South Australia at the Adelaide Oval today. Nominations are now open for the election of our National Office Bearers (2018/2019) which will take place on 7 September at our next face to face meeting in Canberra. The Victorian and Tasmanian Chapters of the Australian Institute of Building (AIB) last night (Friday 20 July) announced the Professional Excellence in Building Awards for 2018. This year, guests heard how the judging panel was impressed with the quality of submissions overall. Last week we hosted the inaugural Hong Kong Professional Excellence Awards at the Hong Kong Sheraton Towers Hotel. While the number of entries for the first time event was modest, the enthusiasm and excitement in the room was high with a really good outcome at the end of the night. Australian Building and Construction Commissioner Stephen McBurney today launched a national campaign aimed at security of payments for subcontractors in the building and construction sector. Australia’s leading construction companies are forecasting a continued solid uplift in major non-residential project work over the course of 2018 and 2019, according to the latest Australian Industry Group/Australian Constructors Association Construction Outlook survey released today. The Western Australia Chapter of the Australian Institute of Building (AIB) last night (Saturday 23 June 2018) announced the Professional Excellence in Building Awards for 2018. 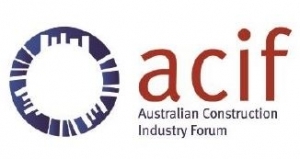 The Australian Construction Industry Forum (ACIF) notes that the recent anniversary of the Grenfell Tower fire in London is a timely reminder of the need for consistent and effective regulation and licensing in the construction industry to ensure the safety and quality of our built environment. The New South Wales and The Australian Capital Territory Chapter of the Australian Institute of Building (AIB) last night (Friday 8 June 2018) announced the Professional Excellence in Building Awards for 2018. The Queensland Chapter of the Australian Institute of Building (AIB) last night (Friday 18 May 2018) announced the Professional Excellence in Building Awards for 2018. The South Australian Chapter of the Australian Institute of Building (AIB) last night (Friday 4 May 2018) announced the Professional Excellence in Building Awards for 2018. The Building Ministers’ Forum (BMF) held its first meeting for 2018 today in Melbourne, to decide on a range of significant measures that will benefit the Australian building, plumbing and construction industry and the wider Australian community. Builders and specifiers looking to construct buildings that boost worker productivity should consider using more of one of the world’s oldest and most sustainable materials in their office fit-outs: wood. That’s the takeout from world-first research by strategic market research firm Pollinate and the University of Canberra. The ACT Government is putting the building industry on notice in response to community feedback regarding building quality across the territory. I trust you had a relaxing Easter break with your family. It is always a special time of year. BIM Object standardisation is now achievable with the release of the NATSPEC BIM Object Properties Generator. The Australasian BIM Advisory Board (ABAB) recently met with Hon Paul Fletcher MP, Minister for Urban Infrastructure and Cities in Canberra ahead of its first Forum for 2018 to discuss how BIM can support the urban infrastructure and smart cities agenda. While it comes around all too quickly, can I take this opportunity to ensure that you renew your membership with the Institute. Dr Phillippa Carnemolla, an industrial designer, researcher and design educator, has been awarded the 2018 National Association of Women in Construction (NAWIC) International Women’s Day Scholarship. Workplace Health and Safety Queensland (WHSQ) has recently shared information with the Queensland Building and Construction Commission (QBCC) about sub-standard installation of safety-critical fasteners in concrete substrates. Banned builder Matthew Geoffrey Rixon has been sentenced to 18 months jail for contempt of court, Minister for Better Regulation Matt Kean said today. Please settle your subscription by the 31st March to ensure that we can continue to deliver services to both you and the wider profession. A Sydney based company and its director have entered into an enforceable undertaking with the Office of Fair Trading (OFT), for alleged breaches of the Australian Consumer Law (ACL). It’s hard to believe that we are already into the second month of a new year! I am happy to announce that the AIB will host Constructing Our World in 2019. I trust you had a great break and that you are inspired and re energised for another year. The Australian Government has today announced the appointment of Mr Stephen McBurney as the Commissioner of the Australian Building and Construction Commission (ABCC) for a five-year term commencing on 6 February 2018. Minister for Small and Family Business, the Workplace and Deregulation, Craig Laundy, said Mr McBurney has been appointed following a merit-based selection process. As a second-generation builder, Prof Heather first visited construction sites with his father at the tender age of four. During his professional career over the past forty-five years, he’s remained just as close to the industry working across the residential, industry, commercial, retail, mining and major infrastructure sectors. Today, Building Ministers held a special meeting to discuss progress with the Assessment of the Effectiveness of Compliance and Enforcement Systems for Building and Construction Industry across Australia being undertaken by independent experts, Professor Peter Shergold AC and Ms Bronwyn Weir. Building approvals are going through the roof, signifying business and investor confidence in Tasmania under the Hodgman Liberal Government. Recent ABS statistics show that Tasmanian building approvals for dwelling units for October 2017 increased by 4.3 per cent from the previous month. This means more homes and more jobs for Tasmanians. The Andrews Labor Government will take action to prevent the use of combustible cladding on Victorian buildings as part of the most significant overhaul of the building sector in decades. Longstanding and highly respected plumbing and fire protection industry leader Carmel Coate has been appointed a Commissioner of the Victorian Building Authority (VBA) Board. The third Building Ministers’ Forum (BMF) for 2017 held in Brisbane on Friday, 6 October 2017, continued to drive decisive action on potentially hazardous aluminium cladding and other efforts to improve the compliance and safety of Australian buildings. A Sydney construction company has been fined $300,000 for failing to properly manage a faulty gate which fell on a worker, fracturing her lower spine and pelvis, Minister for Better Regulation Matt Kean said. 2018 AIB NOMINATIONS AND SUBMISSIONS ARE NOW OPEN! Nominations and Submissions are NOW OPEN for the 2018 AIB Professional Excellence in Building Awards! https://aib.org.au/wp-content/uploads/2015/02/angled-icon-green-36px.png 36 36 Gemma Walker https://aib.org.au/wp-content/uploads/2018/02/logo-aib-2018.svg Gemma Walker2017-11-15 08:46:192017-11-15 08:46:192018 AIB NOMINATIONS AND SUBMISSIONS ARE NOW OPEN! At the most recent meeting of National Council – last Thursday (26/10) it was agreed that the organisation would embark on the development of a new Strategic Plan. I am sure you would agree that most organisations cannot rely with any great confidence in forward planning without a Strategic Plan. Major public transport projects, metropolitan and regional road projects, and a large-scale expansion of Australia’s first GigCity network top the State Labor Government’s 2017 Infrastructure Australia submission. Infrastructure Australia – the Federal agency which prioritises national infrastructure projects – is preparing to publish a new Infrastructure Priority List in February next year. The insulation industry has welcomed the opportunity to work with the New South Wales Government to reduce household power bills through improved energy efficiency in the state. Adelaide will be cooler, greener and more resilient to climate change thanks to urban project grants worth more than $710,000. Minister for Planning and Housing, Anthony Roberts has announced a new plan for Rhodes East, creating a vibrant place to live and work. This R U OK?Day, the McGowan Government will fly the MATES in Construction flag at Parliament House and provide $310,000 in funding to raise mental health awareness among construction and FIFO workers. The Australian Institute of Building (AIB) announced the National Professional Excellence in Building Awards for 2017 last Saturday 2 September. Australia must immediately ban the type of flammable cladding linked to the Grenfell disaster in London and Lacrosse fire in Melbourne, an inquiry has found. The use of polyethylene composite panels has been under intense scrutiny in Australia since the Grenfell disaster in London, which killed at least 80 people in June. Senator KETTER (Queensland) (17:13): I present an interim report of the Economics References Committee on non-conforming building products. Western Sydney Airport will generate tens of thousands of jobs – thousands more than previously estimated – according to new modelling from Ernst and Young. New housing completions in NSW have reached an all-time high, according to the Australian Bureau of Statistics’ latest quarterly building activity data. Minister for Infrastructure, Planning and Logistics Nicole Manison today announced Dr David Ritchie as the new Chair of the Northern Territory Planning Commission (NTPC). Ms Manison said the Territory Labor Government is determined to restore trust in Government and will review planning in its first term, to provide certainty for the community. The Palaszczuk Government has called on eligible construction companies to tender for the construction of new government employee housing in Richmond, Winton and Hughenden. A major summit in August focusing on the role of skyscrapers in global cities has been organised by the Urban Taskforce. Western Australian Building Commissioner Peter Gow today confirmed the Building Commission is broadening its audit of aluminium composite panels (ACPs) following the Grenfell Tower fire in London. The latest Australian Industry Group/Australian Constructors Association Construction Outlook survey released today has reported that after three years of declining major project work, the nation’s leading construction companies are forecasting a recovery in engineering and non-residential building activity for the rest of the 2017 calendar year and in 2018. Two weeks on from the tragic Grenfell Tower fire in London, and nearly 3 years since the Lacrosse apartment building fire in Melbourne, Australian governments have still not taken effective action to protect the public. Building Commissioner Peter Gow today announced a pricing reform to Western Australia’s home indemnity insurance (HII) scheme. Large volume and multi-unit project builders will have to pay a premium increase as of Monday 2 October 2017. Security guards have been posted at a Perth apartment block that houses at-risk young people after a building survey revealed it was clad in flammable aluminium panels. The Palaszczuk Government has called on builders, developers and community housing providers to be part of building new social and affordable housing projects as part of the Palaszczuk Government’s $1.8 billion Queensland Housing Strategy. The Board of the Cross River Rail Delivery Authority has approved the demolition of the GoPrint site at Woolloongabba to make way for Queensland’s number one infrastructure priority Cross River Rail. With the ACT Government undertaking the largest infrastructure project in the territory’s history through the light rail network, further investment will be made in the upcoming 2017-18 ACT Budget to improve safety during the construction of stage one. The NSW Government’s new stamp duty concessions are expected to support around 24,000 people trying to get a foot on the property ladder, Premier Gladys Berejiklian has announced. A major milestone in the ACT’s push towards 100% renewable electricity takes place this week with construction commencing on Crookwell 2 wind farm’s 28 turbines, Minister for Climate Change and Sustainability Shane Rattenbury said today. Work on new tracks that will carry trams around the massive Domain construction site will ramp up next month as part of the Andrews Labor Government $11 billion Metro Tunnel Project. The first tower for Sydney Metro’s iconic railway bridge at Rouse Hill has been lifted into place in a precision operation overnight. The world’s largest rotating seating platform has been installed in the Adelaide Convention Centre’s new East Building, marking the latest milestone for Stage Two of the $397 million redevelopment. Treasurer and Finance Minister Ben Wyatt today announced the temporary boost to the first home owner grant will cease on June 30, 2017. A Housing Package for Western Sydney will offer incentive payments to local councils to deliver housing supply in the right locations. A pipeline of more than 1000 North Queensland jobs will be flowing by the fourth quarter of this year from the $250 million North Queensland Stadium and the $167 million Ravenswood Mine expansion. The State Government is accelerating $3.4 million worth of social housing maintenance project in Whyalla to stimulate local employment. The projects will increase employment opportunities for skilled and unskilled labour, with the employment opportunities open only to Whyalla residents. In an Australian first, the Australasian Procurement and Construction Council (APCC) and the Australian Construction Industry Forum (ACIF) have this week released the Building Information Modelling (BIM) Knowledge and Skills Framework. The ACT Government is delivering the largest ever infrastructure investment program for Canberra as part of our commitment to strengthen our growing economy, detailed in the 2016–17 Infrastructure Plan Update. Tonight, the Senate voted to strengthen the Turnbull Government reforms to the building and construction industry. The Economics References Committee conducted a public hearing in Brisbane on Non-conforming building products. Find attached a copy of the Hansard record for this hearing. With Christmas just around the corner, SafeWork NSW is urging all local builders and developers to ensure construction sites are secured to prevent trespassers and injuries. The Senate has passed the Government’s legislation to re-establish the Australian Building and Construction Commission (ABCC). Having done so, businesses within the construction industry should review their contractual arrangements with contractors and subcontractors, and any current enterprise agreements. NZIOB HOSTED International Construction Conference PULLMAN HOTEL AUCKLAND The New Zealand Institute of Building (NZIOB) in collaboration with the Australian Institute of Building (AIB) and the Singapore Institute of Building Limited (SIBL) is hosting our inaugural collective International Construction Conference. The NSW Heads of Asbestos Coordination Authorities (HACA) today launched a new hotline number to provide free advice and guidance on asbestos-related issues. HACA Chair Peter Dunphy said the new number 1800 Asbestos provides the NSW Community with a central point of contact for making enquiries about asbestos. 2017 AIB NOMINATIONS AND SUBMISSIONS ARE NOW OPEN! To nominate your project into the 2017 AIB Awards Program, simply click on the button to complete an online registration form. https://aib.org.au/wp-content/uploads/2015/02/angled-icon-green-36px.png 36 36 Gemma Walker https://aib.org.au/wp-content/uploads/2018/02/logo-aib-2018.svg Gemma Walker2016-11-07 08:36:552016-11-07 08:42:142017 AIB NOMINATIONS AND SUBMISSIONS ARE NOW OPEN! We welcomed special guest MP Rob Stokes, the NSW Minister for Planning to our Practice Matters open lecture series. The minister gave a rousing presentation discussing the hot topic of Newcastle’s revitalization and sharing his thoughts on five key elements which should be considered for successful urban progress: Change, Character, Connections, Employment, and the Environment. Issues including non-conforming high-tensile bolts, electrical cable and asbestos in cement board has focussed attention on the need to check whether construction products conform to the appropriate standards. The state government says it will rewrite the law governing the way NSW buildings are certified after a damning review found practices for ensuring apartment fire safety were “totally ineffectual” and had caused unsafe buildings to be approved. The 2016 School of Architecture & Built Environment Lecture Series will showcase a wide range of projects, global trends and practice styles from local, national and international industry experts within the Architecture, Landscape Architecture, Industrial Design and Construction Management professions. 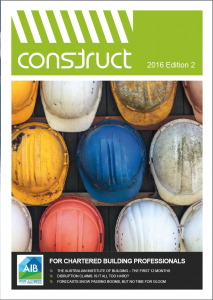 Construction Economics and Building has just published its latest issue at http://epress.lib.uts.edu.au/journals/index.php/AJCEB. The Australian Institute of Building recently announced the 2016 AIB National Professional Excellence in Building Awards in Melbourne, Victoria. Over $39 million was awarded in contracts during June 2016 to upgrade our schools, community housing and other vital infrastructure throughout the Territory, as part of the Country Liberals Government’s record infrastructure investment. Minister for Infrastructure Peter Chandler said the Country Liberals Government invested more than $1.5 billion in infrastructure across the Territory in 2015­16. The New South Wales Chapter of the Australian Institute of Building (AIB) has announced the AIB Professional Excellence in Building Awards for 2016. The Victorian Chapter of the Australian Institute of Building (AIB) has announced the AIB Professional Excellence in Building Awards for 2016. More than 23 building and construction professionals have been recognised at this year’s Awards which were attended by leading industry figures at a gala dinner on Friday, 3 June, 2016. The South Australian Chapter of the Australian Institute of Building (AIB) has announced the AIB Professional Excellence in Building Awards for 2016. More than eight building and construction professionals have been recognised at this year’s Awards which were attended by leading industry figures at a gala dinner on Friday, 13 May, 2016. ACT MBA members need your urgent support. New building and construction industry forecasts released today chart the passing of two booms – in mining and residential – and the impact on this important sector of the Australian economy. AUSTRALIAN INSTITUTE OF BUILDING ANNOUNCE WINNING LEADERS IN THEIR FIELD ACT CHAPTER The Australian Capital Territory Chapter of the Australian Institute of Building (AIB) has announced the AIB Professional Excellence in Building Awards for 2016. The Australian Institute of Building (AIB) today announced Greg Hughes as the new CEO at the leading Institute for building and construction professionals. Announcing the appointment, National President Norman Faifer FAIB, FAIQS, FIAMA acknowledged the excellent contribution the former CEO had made and now looked forward to a fresh strategic approach. Save the date to celebrate the women who are leading in Property, Construction and Project management on International Women’s Day, 2016. Queensland is leading the nation in the strength of building approvals, which were up almost 27 per cent for 2015, according to new figures from the Australian Bureau of Statistics. 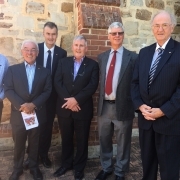 At the Institute’s annual general meeting on the 26th of last month, the membership voted in a predominantly unchanged Council save for a new representative from the ACT Chapter. Australian Construction Industry Forum (ACIF), the building and construction industry’s peak collaborative body, is pleased to announce the appointment of new Executive Director, James Cameron. The AIB’s recently formed Macau branch (part of the Overseas Chapter) recently held an AIB information meeting at the Macau University of Technology. 61-101 Phillip Street Sydney NSW.